Tempted though I am, I’m not going to subject you to my whining about being disabled. I’m saving that for later in the week. Instead, I bring to you my children’s complaint for the weekend. “How come you’ve been baking all weekend and there’s nothing for us?”. As I mentioned last week, I made five lots of morning tea for my husband to take to his week of meetings. Two items were requested from the last set of meetings, hazelnut biscotti and raspberry slice, both of which can be found in my collected works. No, I’m not putting in a link, go find it yourself. I also sent along brownies, which I mixed in the Thermomix, ginger nuts and hazelnut meringue biscuits, which I may share with your at a later date. I did make panettone too, but we kind of went to a friend’s place for an impromptu barbeque, so I sacrificed the panettone to the gods of hospitality, who ate it all up. The kids have been asking me to make panettone for a while now. 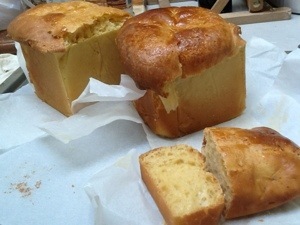 They weren’t easily fobbed off by my initial reaction, which was “you don’t make panettone. You wait until Easter or Christmas, then you go into any shop in our suburb and pull one out of the walls of panettone that magically appear at that time. You then exchange it for one belonging to your neighbour, stick it in the back of the pantry, wait five years then throw it out.” It turns out that flattery works remarkably well on me, so I made one this weekend. And, because of its rapid disappearance into our kind hosts of last night, again today. You can really make it with a wooden spoon, but if you have a KitchenAid it is dead easy. First you gather your materials. I’ll bet you don’t have orange essence in your pantry. Or glycerine. Apparently you can leave out the glycerine and use lemon zest instead of the essence, but the way I did tastes just like a bought one, only not redolent of dust and moths. Place in your KitchenAid bowl 200 grams of water, fifteen grams of fresh yeast (or a seven gram sachet of dried yeast), 25 grams of caster sugar and 25 grams of for flour. Whisk them all together. Add six egg yolks and beat them in. Save the whites for fun stuff like hazelnut meringue biscuits, Thermomix macarons (can’t wait to try that recipe), or today it was lime and poppyseed friands. Beat in three teaspoons of glycerine, three teaspoons of vanilla essence and two teaspoons of orange essence. Melt together, carefully, 50 grams of butter and 50 grams of white chocolate. I’m still working on this in the Thermomix, when I have it fail safe I’ll let you know. We got there in the end. Beat that into the mix. Mix in 400 grams of flour and a teaspoon of salt if your butter was unsalted. The recipe says just mix it in with the wooden spoon, but because I had the KitchenAid running, and it was a yeast thing I thought I’d let it mix for a few minutes. It did start getting all stretchy and satisfactory looking, so I’m keeping that step. Let it rest for five minutes, then fold in 150 grams of bits of your choice. Or not. I’m going with golden raisins this time, I’ve got a bit of a thing for them lately. They’re nicer than bog standard sultanas. Then you choose your pan or pans. 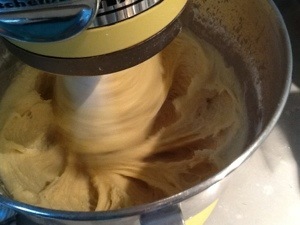 The mix is very wet, not like bread dough at all, and really sticky. So if it rises out of the pan it will droop sadly down the sides and be a bit of a bugger to get off. I’m using a small loaf pan and a little square tin. Line them with baking paper, make sure the paper goes all the way up to the top. Only fill the tins a third of the way up. Leave them somewhere warm until they’ve almost tripled in height. You can gently brush a sugar syrup on them, or sugar beaten with egg white. Or not. Bake them at 180 degrees for about half an hour. More if you actually have a panettone tin and a baking the lot as one loaf. This produces a very light sweet loaf that looks like it will toast well if we manage to keep it for more than a day. It has that hint of orange without having peel in it (hardly anyone likes peel, it’s very sad). Have a go at it. I could do it standing on one leg.